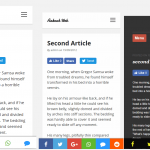 WP Socializer is an all in one complete social media plugin to add native social media buttons, icons, floating sharebar, follow us buttons, profile icons, mobile sharebar and selected text share popups easily with TONSof customization. Insert 50 social share icons which are highly scalable. Insert 50 follow me icons in floating bar and widgets. Add mobile sharebar which supports icons of 50 networks. WP Socializer loads webpages faster since scripts required by buttons are loaded only once and also when necessary. 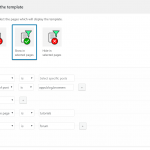 This increases the page load faster even when multiple buttons are used in the same page. WP Socializer is 100% mobile ready with all the required options required for targetting mobile audience. Social icons are retina ready and displays sharp icons even deep zoom in mobile devices. Faster on both mobile and desktop devices as resources are loaded conditionally. With WP Socializer, you can create your own design for the social button and icons which are placed before and after posts and pages. There is no restriction to specific set of themes. 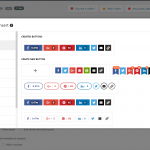 With the advanced share buttons builder system, you can easily customize your website social media features. Home, front & 404 pages. Category, tags attached to posts. 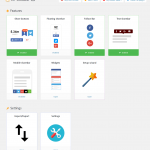 With WP Socializer plugin, you can add the native share buttons provided by leading social media websites. 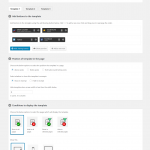 Buttons settings can be changed inside the admin page itself. 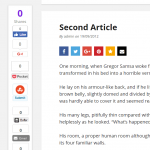 All kinds of native social buttons from the below providers can be created. 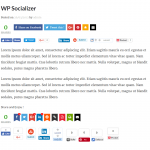 WP Socializer can also be used to insert widgets to WordPress sidebar. Below list of widgets can be added. 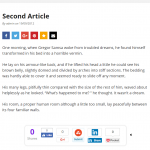 Social buttons/icons to share the current post/page. There is also support for shortcodes with which social media buttons can be placed anywhere in posts and even in themes directly. The list of social buttons which can be inserted can be seen below. There is also support for follow us / profile icons which can placed in widget or near the sides of the window. In addition to this, popups can also be added to share selected text which allows visitors to share the quoted text. WP Socializer has a built-in setup wizard with which it takes only ~3mins to add social icons and buttons to your site. If you find that any of the social buttons are missing, they can also be added via the “custom HTML” feature built into the plugin.